extended from Oldtown Road up Chapel Hill and down Virginia Avenue to Laing Avenue. In 1895 a horsecar line was in operation from below the B&O Railroad crossing on Virginia Avenue to the fairgrounds at the end of Virginia Avenue. This horsecar line was constructed by a real estate development company and had no connection with the Cumberland Electric Railway. In 1914, the Second Street line was connected at Second Street and Virginia Avenue to the Virginia Avenue line. The Virginia Avenue subway under the Baltimore and Ohio Railroad tracks was opened October 29, 1925. 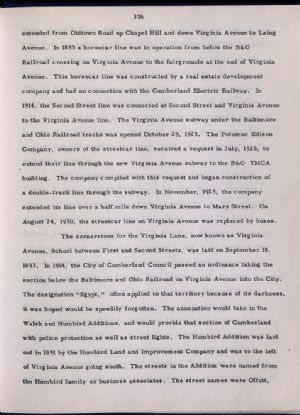 The Potomac Edison Company, owners of the streetcar line, received a request in July, 1925, to extend their line through the new Virginia Avenue subway to the B&O YMCA building. The company complied with this request and began construction of a double-track line through the subway. In November, 1925, the company extended its line over a half mile down Virginia Avenue to Mary Street. On August 24, 1930, the streetcar line on Virginia Avenue was replaced by buses.